"Metaphys Armed Dragon" and "Metaphys Ragnarok" in the artwork of "Metaphys Factor"
"Metaphys" (メタファイズ Metafaizu) is an archetype of LIGHT Wyrm monsters that debuted in Duelist Alliance but did not have any support until Circuit Break. With the exception of "Metaphys Executor", they are all counterparts to existing monsters from the Duel Monsters and GX eras of Yu-Gi-Oh. The Effect Monsters revolve around banishing each other and gaining advantage upon being banished. Some of them gain an additional effect when Special Summoned by the effect of a "Metaphys" monster. Their effects are quite diverse, ranging from the search of resources to the mass removal of monsters or spells and traps. Due to the mechanic revolving around their banishment, they have synergy with effects like that of "Sacred Sword of Seven Stars", "D.D. Sprite", "Gold Sarcophagus", etc. 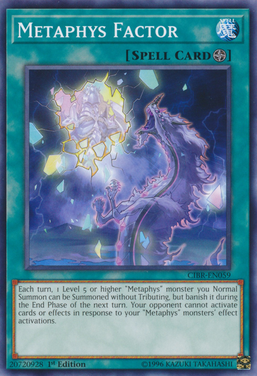 "Metaphys Executor" banishes 5 different "Metaphys" cards for its summon, so it is a good idea to use "Necroface" to recycle those cards for later use. "Metaphys Armed Dragon" can be used as a material for "Executor" and you can get it back by using "Metaphys Dimension" or the Level 10 "Metaphys" monster itself. This page was last edited on 5 April 2019, at 08:34.